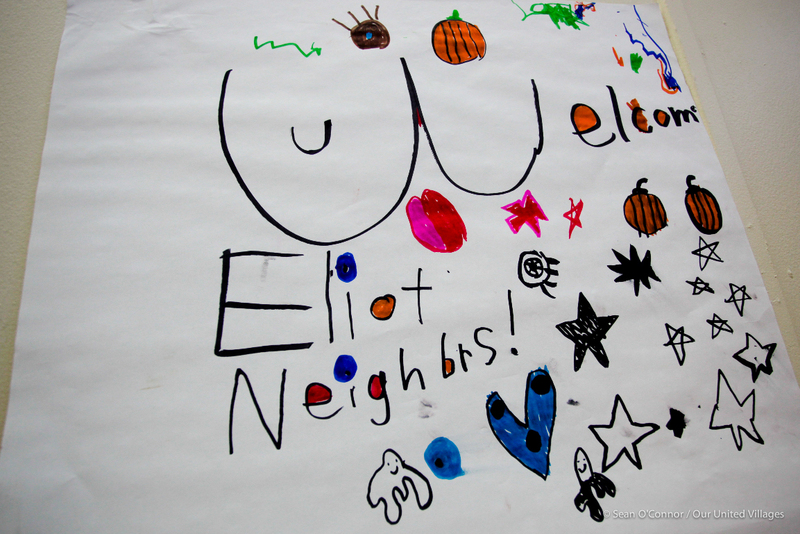 In October 2014 Eliot Neighborhood Association reached out to everyone living or working in the neighborhood for three Community Conversations around the past, present and future of Eliot neighborhood. For the first Conversation on October 8th an array of photos, maps, and open ended questions were set up at the St Philip the Deacon Church on 120 NE Knott St. Folks had a great time meeting neighbors, chatting and discussing the neighborhood. Our United Villages (OUV) helped facilitate discussions. OUV, a nonprofit organization, is independently funded by the ReBuilding Center. OUV believes that every community, no matter how it is defined, has tremendous capacity for enriching the day-to-day lives of everyone within it. OUV inspires people to value and discover existing resources to strengthen the social and environmental vitality of communities. You can find out more about OUV and their programs at ourunitedvillages.org. The second round of Community Conversation on October 22, 2014 generated much enthusiasm for action. Folks wanted to become involved to improve their community. Comments gathered from the first Conversation were categorized and presented as table topic discussions, intending to deepen the Conversation. Groups had one of four topics: Pride and Identity; Safety; Social Engagement; and Re-Development. They were given all the comments from the previous conversation gathering. Their ideas and wishes were further prioritized by the folks who attended the 3rd Community Conversation on November 5, 2014. Priorities for action, strengths and concerns are below. From these conversations the Board concluded that folks want leadership to facilitate their involvement, acknowledging and respecting diversity. They want clean safe neighborhoods. They are concerned about the direction and control of redevelopment, and desire consciousness of affordable housing. Folks want to have ways to become involved, have social events and to stay informed.